We have heard that several of our family members and friends are suffering from physical and emotional issues. I wanted to start this blog to let you know that even though we are many thousands of miles away from most of you that our thoughts and prayers are with you. We wish we could be there with you to ease your pain and your burdens. That is what the Savior taught us to do. I know there are those of you who would prefer not to have anyone help or even visit, but remember that you are depriving those who want to help from blessings from our Father in Heaven. This reminds me that He knows how I feel, although my sufferings are not nearly as great as His. We have a copy of a painting by Del Parson hanging in our home that we love. It is a bit unusual. 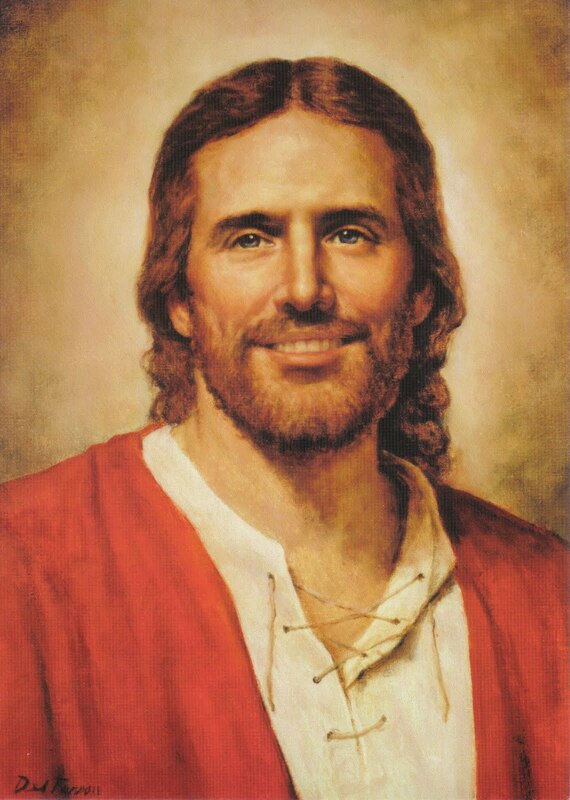 It is a painting of the Savior with a smile on his face. This picture is a reminder that the Gospel of Jesus Christ is for our happiness. He wants us to be happy. The Gospel can bring that happiness to us. Along those same lines, there is a quote by Heber C. Kimball that tells us of His personality. I am perfectly satisfied that my Father and my god is a cheerful, pleasant, lively, and good-natured Being. Why? Because I am cheerful, pleasant, lively, and good-natured when I have His Spirit. . . . That arises from the perfection of His attributes; He is a jovial, lively person, and a beautiful man. I love this quote! We don't often think of Christ being described like this, but the description is one that I can picture and appreciate. There is one more quote that I would like to share, and that is the Missionary Purpose. We recite this each week in our district and zone meetings. Our purpose is to invite others to come unto Christ by helping them to receive the restored gospel through faith in Jesus Christ and His Atonement, repentance, baptism, receiving the gift of the Holy Ghost, and enduring to the end. That last phrase is important for all of us . . . enduring to the end. Many of the members here have so very little in the way of material comforts, but their testimonies are strong. They are happy in the Gospel and what it means in their lives. We pray that each of us will strengthen our faith in the Atonement of Christ and endure to the end. A much appreciate service project from the District Elders! Elder Y is very meticulous! Elder O, T, and S finishing up. Look carefully! That's ice cream between two slices of white bread. Malaysian style Neopolitan ice cream . . .
One, very large grasshopper (belalang)! Thank you to Elder T's expertise in packing the lorry for the moving of the Chinese Elders! We got it all in one load! Thank you to Elders T, S, S, O, Y, and E for their hard work! Before I close, I want to say how humbled I am with the members here. I didn't understand a lot of what was said in testimony meeting today, but I felt the Spirit very strongly. A couple of quick notes about Sunday . . . Brother Steven's son, Peterson, came to church in a new suit. He was dressed to kill! What a little dude! In the evening we went to Brother Steven's to break our fast. President Gara and some of his family were there, too. The apartment complex where Brother Steven and family live. We've decided to read your blog on Monday mornings as part of our family scripture study time.